A dramatic shot of Circle 7 at Carrowmore looking east to Copes Mountain. No. 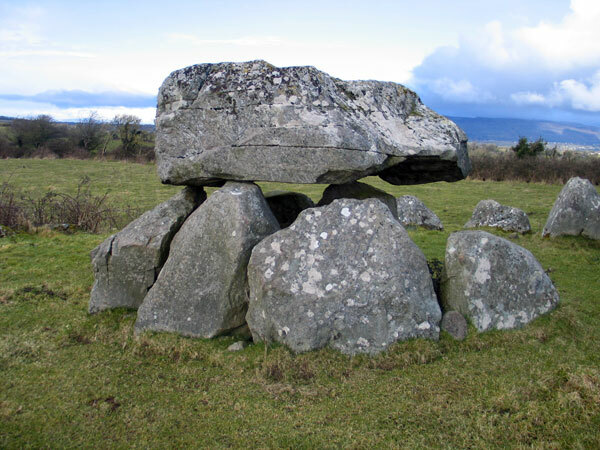 7 (1) (dolmen-circle): to the northeast of 6. 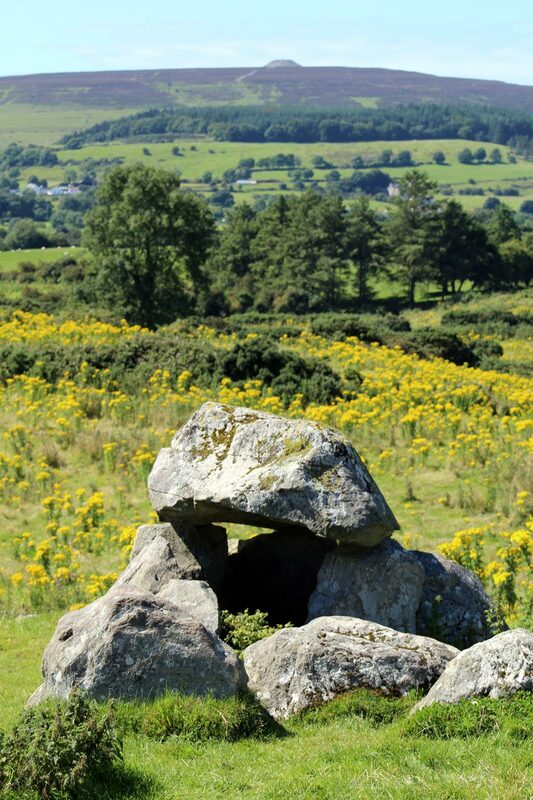 This was called Leaba-na-bhFian (Bed of the Fian, or Warriors); now called the Kissing Stone. "This circle and its cromleac are perfect. Its diameter is 37 feet, and the number of stones 32. 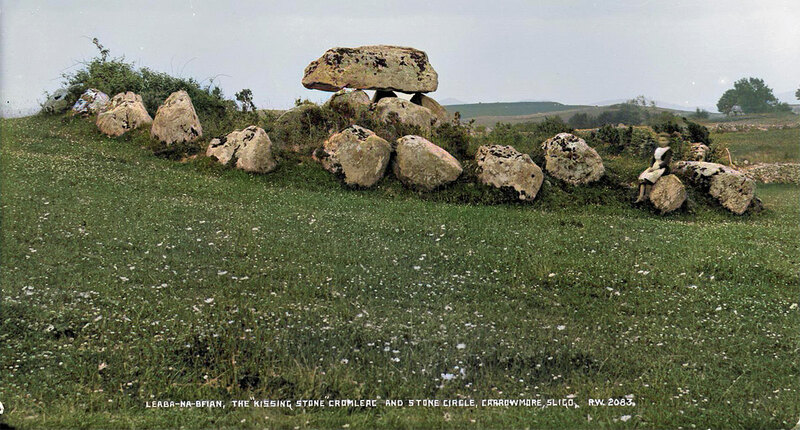 The cromleac is about 8 feet high, the table-stone resting on six stones. It is 9 feet long, and 23 feet in circumference. The situation of this circle being on the ridge of a hill, gives it a very striking and picturesque effect." - Petrie. "Of the entire series, this is undubitably the finest and best-preserved cromleac and circle. The porch-like entrance is very remarkable." - Wood-Martin. 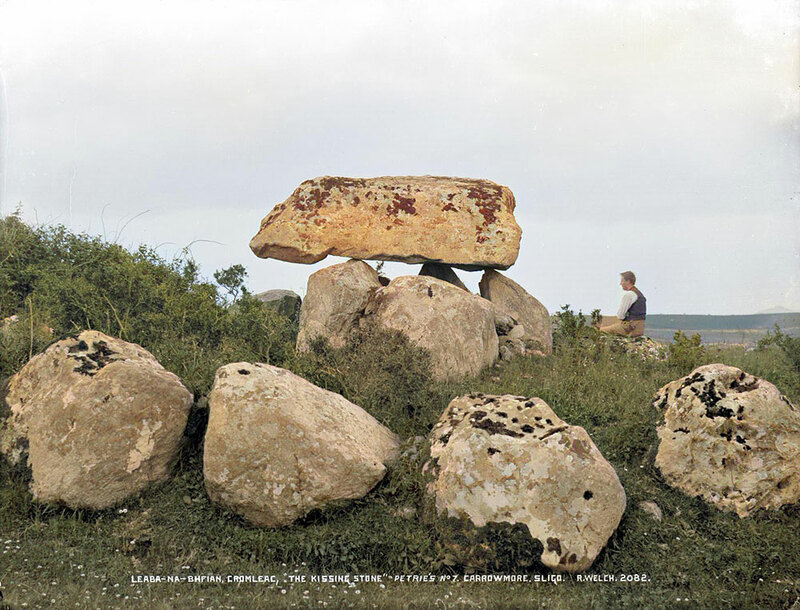 The Kissing Stone, photographed by Welsh. It was possibly a similarly porch-like appearance which caused the portuguese to call a dolmen an Anta, antae being the name of the porch of the Roman temples, aediculi, and cellae memorie, or shrines of the dead. Such structures were, according to Vitruvius, divided into the cella, which was the inner, and the ante, which was the outer portion. In regard to the size of this dolmen, Col. Wood-Martin remarks that it is the only one which can be entered in a semi-upright position. The same writer appends the results of excavations conducted by him in the dolmen itself. The dolmen of Site 7. "It had evidently undergone a thorough clearing out before. The soil, however, was well resifted, and the corners and crevices carefully examined. A couple of stones of the flagging still remained in position at the angles. Here were found 80 small fragments of bone, greyish-white in colour, possibly calcined. Amongst these was the tooth of a young pig, one valve of a mussel shell, one valve of a cockle shell, two small shells of the genus Helix, several portions of other shells, and a remarkably fine specimen of a "thumb-flint," by which Col. Wood-Martin means a flint flake such as would have done for a "strike-a-light." The dolmen of Site 7, looking west to Knocknarea and Queen Maeve's cairn. It is very similar, indeed, to one found by me under a small dolmen among an immense quantity of burnt human bones, in a tumulus, once probably encircled, near the Rosemoddress circle and Boleit menhirs in West Cornwall. Flint is foreign to the district of Cuilirra, but is found in Antrim, Down, and Londonderry. On looking at the ground plan of this dolmen-circle, it may occur to others, as it occurs to me, that there are indications that a passage may, and probably did once lead into the dolmen from the southeast side of the outer ring, a proof that it was not intended that the dolmen should be wholly closed up in its cairn. 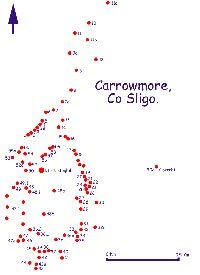 Site 7 at Carrowmore is built on the side of a low hill.